The holiday season is here. Thanksgiving Day has come and gone. Christmas, Hanukah, and New Years will be here in the twinkling of an eye. It’s easy to get caught up in all the excitement, hoopla, and glitz of the extended festivities. After all, the big box stores, TV, radio, online ads, and printed fliers have been pushing their holiday wares for weeks now. I try not to pay too much attention to all that holiday hype. In my retirement, I have, instead, come to enjoy each moment, anticipate the day at hand, and celebrate the unfolding daily events. I have also learned that that is much easier said than done, given the state of the world, the conniving of greedy people and corporations, the unsettling of Earthly events, natural and otherwise. Still, we must carry on. So I did, and I do. This particular day I joined a senior citizens’ hiking group led by a retired banker, a most trustworthy man. 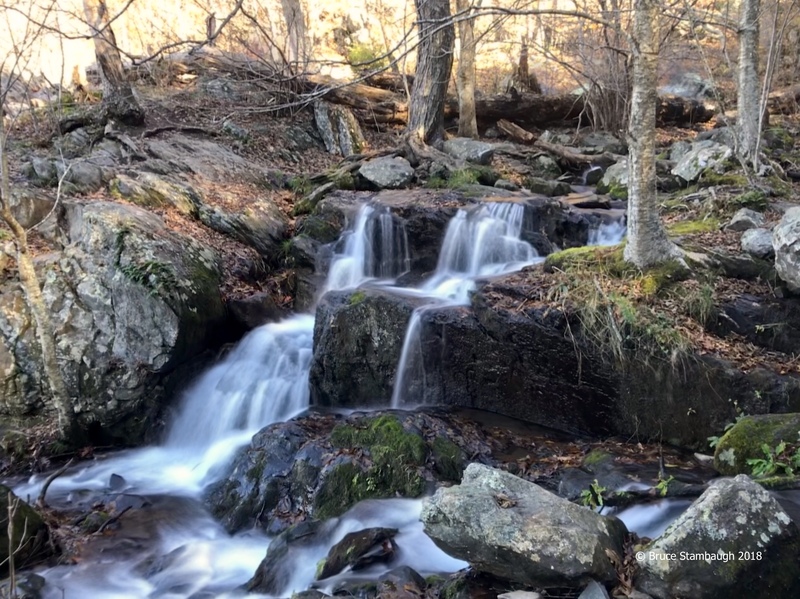 Our destination was Lewis Falls in Shenandoah National Park. Our group of nine wound its way down the trail through the shedding deciduous trees, brushing against mountain laurel whose berries the forest birds and bears had not yet devoured. We crisscrossed several small streams, all of them rushing to plummet the 83 feet of Lewis Falls. These cascading ribbons join just as they tumble into the Shenandoah Valley. We stepped gingerly across the last of the wetted stones and finally made it to the shaded overlook of the falls themselves. We refueled at that lovely sight on the snacks we each had brought along. I climbed over the protective stonewall to get a slightly better view of the falls. It nearly cost me my life. I pitched the last handful of peanut butter cracker crumbs into my mouth and tried to swallow. I couldn’t. I tried to breathe in. No air made it to my lungs. I didn’t want to die this way. My EMT training kicked into gear. I got the attention of the nearest person and pointed to my throat. She asked me if I was choking and I nodded my head frantically. She hollered for the others and started to jump the wall to help me. In these 20 seconds or so, I continued to try to swallow. I couldn’t speak. I thumped my chest with my fist twice, made a growling sound, and attempted to swallow again. Just as this courageous woman was about to apply the Heimlich maneuver, I felt the mountain air tickle my lungs. I took a swig of water, waved off my would-be rescuer, and spoke a few raspy words of thanks. The woman was heartily relieved, but not nearly as much as me. As we backtracked up the zigzag trail, everything looked brighter, the colors more vibrant, the air sweeter. The trek back to the cars seemed much shorter, easier even until someone noticed that Herb was missing. The tallest member of our pack, Herb had headed back ahead of the rest of the group. But he wasn’t at the parking lot. The retired banker quickly formed a plan, and once again my firefighter/EMT training instinctively activated, only this time for a search and rescue effort. Though frustrated for nearly two and a half hours, the search ended happily. Herb was found safe and sound. We all headed for home in thanksgiving and wonderment of creation and life itself. In the midst of all the mundane marketing and holiday cheer, I have a suggestion. Let’s remember to be thankful for life itself. 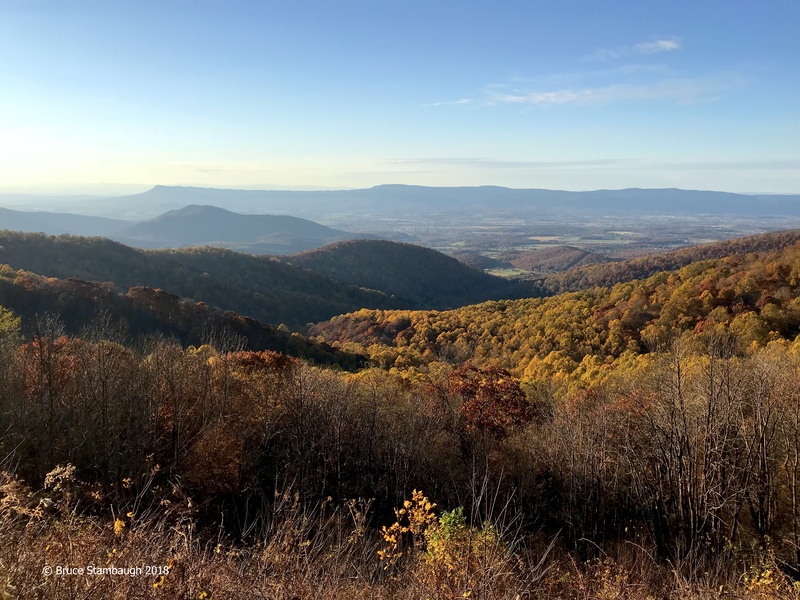 The view of the Shenandoah Valley seemed even more pristine than usual despite the muted colors. I’ve been known to exaggerate. Believe me, there is no exaggeration in this story. The day dawned bright and cheery. 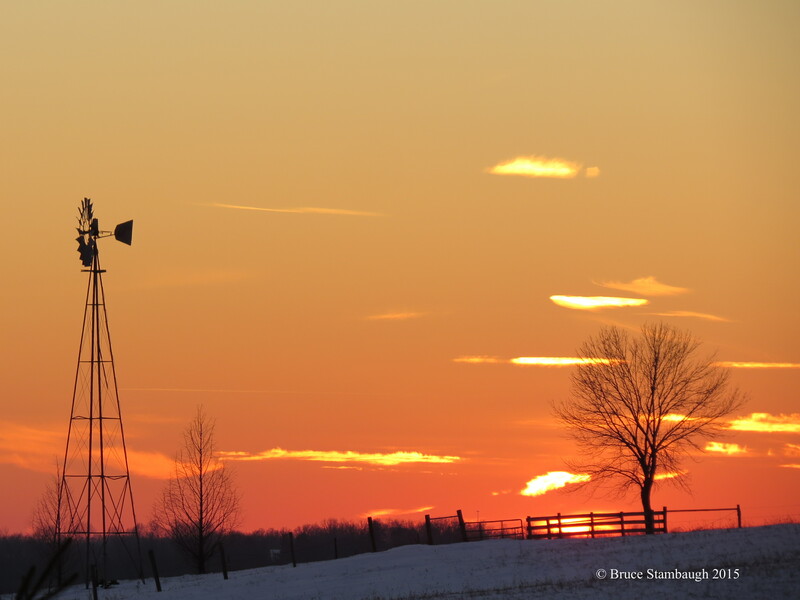 An orange sunrise quickly transitioned into a rare cloudless January day in northeast Ohio. I was glad for that. I had a wide variety of activities planned. However, I could not begin to imagine how an unforeseen incident would impact not just the day itself, but my life, too. First and foremost on the agenda was to complete a final draft of yet another newspaper column. Lunch would be early since I had a 1 p.m. appointment in my hometown, Canton, Ohio. I am fortunate that I married a woman who loves to cook. She rules the kitchen. I help where needed, usually cleaning up afterward. Not this Saturday. I arrived at my appointment right on time. An hour later I was visiting with my friend and barber, Paul, who was recovering from a severe stroke at a rehab facility near where I had been. I had a marvelous visit with Paul and his wife. It was great to have him on the road to recovery. Their congeniality energized me. Next I went in search of a couple of rare birds reported in the area. On the way, a small flock of American Robins flew across the road in front of me and landed in a crabapple tree loaded with fruit as orange as the birds’ breasts. I imagined the birds devoured the aged apples. Despite my best attempts, I couldn’t locate the wayward warbler near Massillon. It should have been in tropical climes by now. 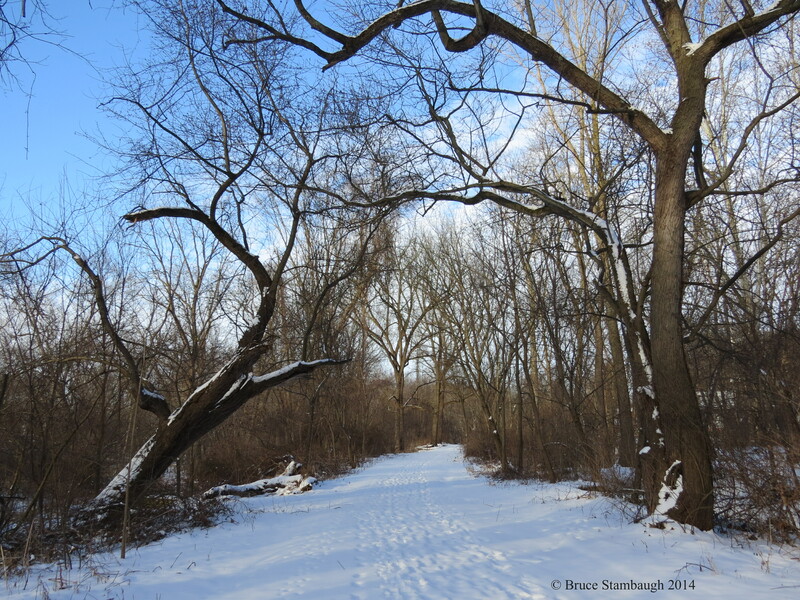 With the sun shining brightly, I found the cold, sharp January air refreshing. Next up was my third attempt to locate a Snowy Owl in Sugarcreek. Others had seen it only a few minutes after arriving. Not me. This visit was strike three for me. I arrived at my final destination near dusk. The friendly property owner, who happened to be outside, graciously welcomed me. I asked his assistance in finding another rare bird near his home. First though, the glowing sunset caught my eye. 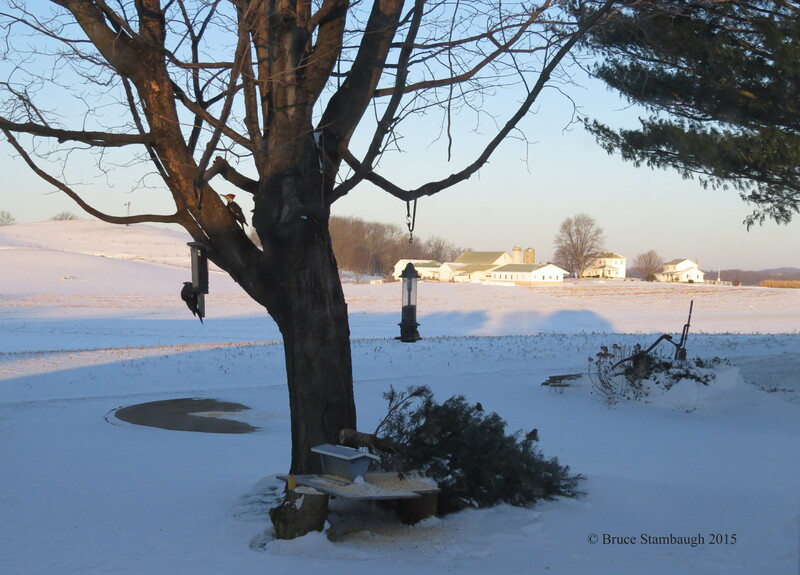 Even if I missed this bird, the view of the setting sun from this kind man’s backyard was stunning. With the light growing dim, my new friend suggested we look for a pair of Short-eared Owls that he had seen on the farm just east of his home. Sure enough, there they were, majestically coursing the snow covered pastures for four-legged varmints. When one of the owls caught one, it buzzed by the other one instead of eating the critter. Was it showing off? Back home, my wife, Neva, and I basked to the crackling of the fireplace while watching college basketball. It had been an eventful day. Of course, none of these fulfilling proceedings would have happened if it hadn’t been for my wonderful wife. I failed to tell you that at lunch I choked on a piece of chicken. Fortunately, Neva was nearby, and her instincts kicked in. With three thrusts of the Heimlich maneuver, the chicken dislodged, and I could breathe again. Neva’s quick action enabled me to fully appreciate every moment of that day, and all that has transpired since then. Clearly, that is the very model of understatement. Words are too cheap to express my utmost gratitude. Neva definitely saved the day and my life. There is simply no better way to put it.